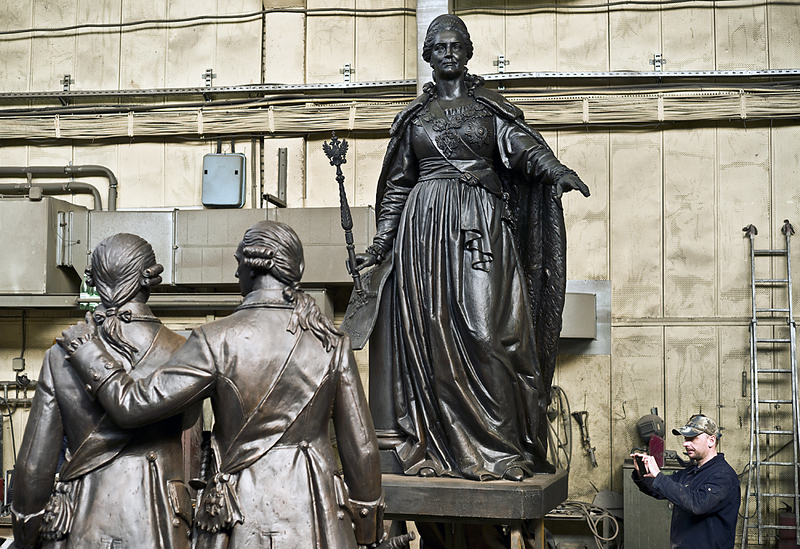 The monument to Catherine II and bronze figures of Prince Grigory Potyomkin-Tavrichesky and Vasily Dolgorukov-Krymsky at Lit Art sculpture production plant in Zhukovsky near Moscow before being sent to the Crimea. A reconstructed monument to Empress Catherine the Great, who made Crimea part of Russia in 1783, was dedicated in the capital of the Black Sea Peninsula, Simferopol, on Aug. 19, according to an on-the-scene TASS correspondent. The ceremony in the Yekaterininsky Garden drew hundreds of the peninsula’s citizens and visitors. Crimean Head Sergey Aksyonov and Crimean Parliament Speaker Vladimir Konstantinov, along with representatives of the clergy and Cossacks attended the event. "This is a remarkable day - we have restored the monument to Catherine the Great," Aksyonov exclaimed. "I’m sure this will become a favorite place for Crimeans and this day will remain in our memory forever," he added. The monument is a 10-meter high, multi-figured composition with a bronze statue of the empress containing busts and statues of Russian statesmen and military leaders, including Alexander Suvorov, is said to weigh roughly 7 tonnes. The renovation work, which cost some 46 million rubles ($722,000) was financed by public donations. The monument was first unveiled in 1890 in Simferopol and was dedicated to the 100th anniversary of Crimea’s incorporation into Russia. It remained in the city garden for 30 years and was dismantled in 1921. During the Great Patriotic War (1941-1945) the monument was completely destroyed. Several attempts were made to reconstruct it in the 1990s but this idea was not backed by Ukraine’s authorities. Crimea had first joined the Russian Empire in 1783, when it was conquered by Catherine the Great. Her reign is considered to be Russia's golden age. The monarch issued a manifesto on Crimea’s accession, promising the local citizens to "defend and protect them, their property, cathedrals and inherent faith."